While swirling the Barbera we tried to figure out the aromas. This was a bit of a challenge for Neil who is fighting off a cold but we were both able to find a few. I noticed fruit, spice and some type of candy that I couldn’t quite pinpoint and Neil identified black cherry and cassis. I found the flavor to be pretty interesting, an initial taste of chocolate, spice everywhere, cherry cola and a light finish. Neil picked up bold black cherry and cassis, alcohol and it was sweeter than he expected. We had tried Comte in France while we were there but were excited to try it in America. One funny thing was that I was trying to imagine the original shape of the cheese, after seeing such giant wheels of it, and match that up to our wedge. Neil showed me how to make that work by holding the wedge on it’s side. (http://mferraro73.tumblr.com/post/82049832636/while-we-were-in-france-we-figured-we-should-try) Ok well onto the tasting, we both made note of the texture; medium, almost spongy, soft and slightly crumbly. The flavors were tangy, slightly creamy, a little funky and “cow milky”. Another notable characteristic was a slimy rind, we decided to cut that off and not eat it. Overall a tasty cheese! As we paired the Barbera and Comte, Neil tasted a lot of cherry cola after the cheese and found the wine to make the cheese more herbaceous. I thought the spice and fruit increased after the cheese, also a vanilla flavor surfaced. 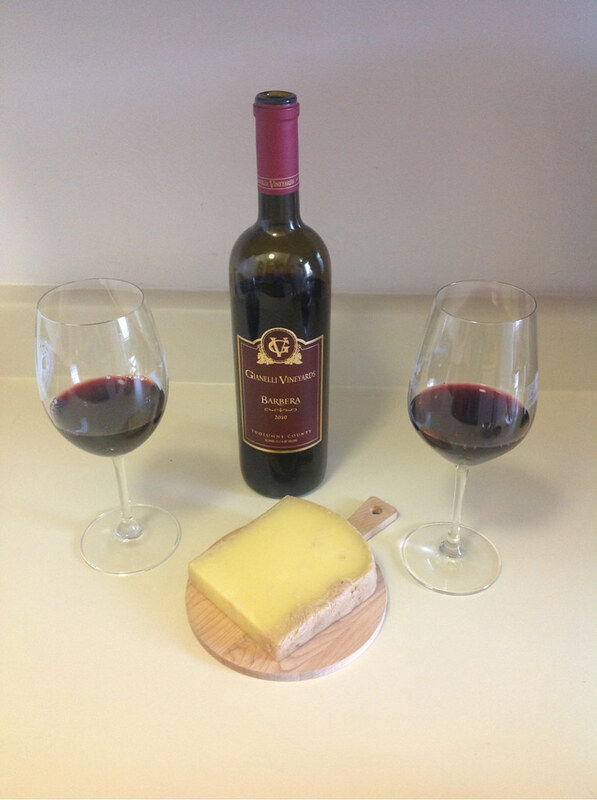 When tasting the cheese after the wine, I first noticed more alcohol from the wine and then the cheese to be more mild and less tangy. Neil rated it as a great pairing, I’d say it was good but I didn’t like the way the alcohol came out after the cheese.